Interstate 190 is a short spur from Interstate 90 south into Downtown Rapid City. It runs concurrent with U.S. 16 as part of a route to Black Hills National Forest and Mount Rushmore National Monument. A single point urban interchange (SPUI) was constructed along Interstate 190 at Silver and North Streets from September 2015 to October 2017. Construction included the replacement of the I-190 overpasses above North Street and the removal of the frontage roads south of there. Work also added a bike path along the west side of I-190 to the north. Interstate 190 opened in 1962.2 The bridges over North Street were built in 1958.1 The exchange joining the north end of I-190 with I-90 was reconfigured from a directional T interchange with left ramps into a trumpet interchange in 2000. NB I190 on ramp @ Anamosa St. will be closed permanently & traffic will be switched head to head in the NB Lanes beginning Monday March 7. Source: 2016 South Dakota Traffic Flow Map, South Dakota Department of Transportation (SDDOT). North Street east at the single point urban interchange (SPUI) with Interstate 190 and U.S. 16. Photo taken by Joseph Barnes (12/13/17). Interstate 190 and U.S. 16 conclude just north of the Anamosa Street on-ramp from West Boulevard at a trumpet interchange (Exits 1A/B). Photo taken 08/12/13. Single lane ramps partition for Interstate 90 & U.S. 14 east to Wall and west to Sturgis, Spearfish and Sundance, Wyoming. Photo taken 08/12/13. Interstate 90-U.S. 14 east & SD 79 south traverse the hills separating industrial west Rapid City from the residential street grid on the one mile approach to I-190 south & U.S. 16 west. Mount Rushmore is the I-190 control point, as the freeway represents the initial leg of the U.S. 16 route southwest to Rockerville and the national monument. Photo taken 08/20/14. Exit 57 departs Interstate 90 east for I-190 south to Downtown. U.S. 16 and U.S. 16 Truck begin here as well. The U.S. 16 parent route bisects Rapid City southward, while the truck route combines with SD 79 around eastern reaches of the city from Exit 61. Photo taken 08/20/14. I-90 travels between retail areas on the 1.75 mile approach to Interstate 190 and U.S. 16. Traffic counts recorded by SDDOT in 2016 increased from 30,400 vehicles per day here to 37,060 vpd ahead of I-190. Photo taken by Joseph Barnes (12/13/17). Passing through the diamond interchange (Exit 59) with Lacrosse Street on I-90, U.S. 14 and SD 79 west. Black Hills National Forest is a control point for Interstate 190 south & U.S. 16 west in the westbound direction of I-90 only. Photo taken Joseph Barnes (12/13/17). An auxiliary lane accompanies Interstate 90-U.S. 14 west & SD 79 north from the adjacent SPUI with Haines Avenue to Exit 57 with I-190 south & U.S. 16 west. Photo taken Joseph Barnes (12/13/17). Exit 57 loops away from I-90 & U.S. 14-SD 79 west for Interstate 190 south and the eastbound beginning of U.S. 16 to Downtown Rapid City. Photo taken Joseph Barnes (12/13/17). A directional T interchange originally joined Interstates 90 and 190. The exchange was reconfigured into a trumpet to eliminate left-hand ramps along I-90 westbound. Photo taken by Jay Maynard (07/05/02). Sign changes made by 2007 for Exit 57 added a greenout for Downtown, reflecting the completion of the U.S. 16 Truck bypass encircling southeast Rapid City. Photo taken by Jay Maynard (07/05/02). I-190 south & U.S. 16 west begin and lower toward the Anamosa Street overpass and Exit 1C. Nickel Street (formerly West Boulevard) forms a west side frontage road to Silver Street. Photo taken Joseph Barnes (12/13/17). The lone southbound shield for Interstate 190 was restored during the I-190/Silver Street Interchange Project. Photo taken Joseph Barnes (12/13/17). Removed by 2007, these were the first confirming markers for both Interstate 190 south & U.S. 16. Photo taken by Jeff Royston (03/17/05). Continuing south from Anamosa Street, Interstate 190 & U.S. 16 meet South Dakota 44 (Omaha Street) and West Boulevard in 0.75 miles. Photo taken Joseph Barnes (12/13/17). Exit 1C departs I-190 south & U.S. 16 west for North Street and Rushmore Plaza City Center. Photo taken Joseph Barnes (12/13/17). Interstate 190 spans Rapid Creek just ahead of the signalized intersection with South Dakota 44 (Omaha Street) and West Boulevard. U.S. 16 turns east along side Omaha Street for one block to Rushmore Road through Downtown Rapid City. Photo taken Joseph Barnes (12/13/17). 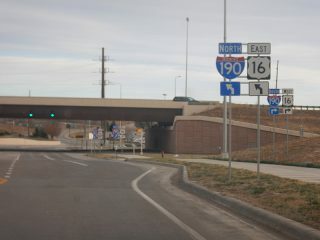 A new sign bridge replaced this assembly at the south end of I-190 when South Dakota 79 was realigned in 2005. The state highway formerly took an in-city route along Sturgis Road, and Chicago, Omaha and St. Joseph Streets. Photo taken by Jay Maynard (07/06/02). U.S. 16 dog legs along Omaha Street (SD 44) west from Mount Rushmore Road to Interstate 190. Photo taken Joseph Barnes (12/13/17). Overheads omit U.S. 16 east on South Dakota 44 (Omaha Street) as the six-lane arterial intersects West Boulevard south and I-190 north. SD 44 constitutes a truck route bypass of Downtown Rapid City. Photo taken Joseph Barnes (12/13/17). U.S. 16 east turns north onto the freeway beginning of Interstate 190 to end at I-90. The US highway formerly combined with Business Loop I-90 east from Downtown Rapid City to Interstate 90 at Exit 60. Photo taken Joseph Barnes (12/13/17). The intersection linking U.S. 16 and SD 44 along Omaha Street with West Boulevard south and Interstate 190 north was reconfigured by 2017 to eliminate this traffic island. Photo taken 08/12/13. Approaching Interstate 190 and U.S. 16 along SD 44 east & 79 south, prior to the 2003-04 expansion of Omaha Street to six lanes. Photo taken by Jay Maynard (07/06/02). Omaha Street east at West Boulevard and the Interstate 190 freeway. South Dakota 79 formerly continued east with U.S. 16 west from here to Business Loop I-90 in Downtown. Expansion of Omaha Street here removed these shields, and as of 2015 they were not replaced. Photo taken by Jay Maynard (07/06/02). A second set of signs were posted on the northeast corner of Omaha Street at I-190 and West Boulevard. These were replaced during the Omaha Street Project to no longer reference U.S. 16 east. The assembly with SD 79 was replaced by 2003 with a new sign bridge for the adjacent split of U.S. 16 west from SD 44 east. Photo taken by Jay Maynard (07/05/02). Interstate 190 & U.S. 16 combine at Omaha Street and immediately cross Rapid Creek between Memorial Park and Executive Golf Course. Photo taken Joseph Barnes (12/13/17). Entering the August 2017-completed SPUI (Exit 1C) with North Street to Rushmore Plaza Civic Center on I-190 north & U.S. 16 east. Photo taken Joseph Barnes (12/13/17). The I-190/Silver Street Interchange Project included the addition of confirming markers for I-190 and U.S. 16 at the North Street underpass. Photo taken Joseph Barnes (12/13/17). West Boulevard connects Business Loop I-90 (St. Joseph Street east / Main Street west) with the northbound beginning of Interstate 190 directly. The freeway begins north from West Boulevard and Omaha Street (South Dakota 44). Photo taken 08/12/13. Exit 1C formerly departed here for West Boulevard, but 2016 construction of the I-190/Silver Street Interchange project permanently closed this ramp. Photo taken 08/12/13. “Omaha Street to Open Ahead of Schedule.” South Dakota DOT, press release. July 1, 2004. I-190/Silver Street Interchange Project Newsletter. September 2017. Page updated January 11, 2018.